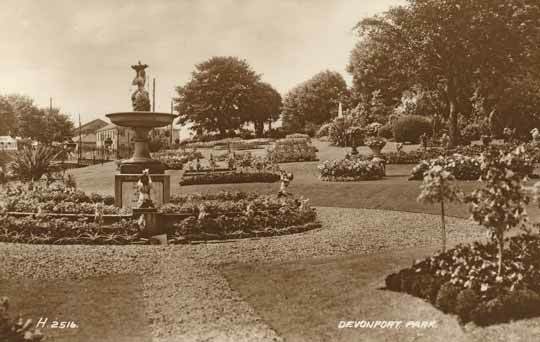 In 1863 the fountain in the image below was installed near the Fore Street entrance to Devonport Park, a few metres west of the lower lodge. It is commonly called the Napier Fountain or the Napier Memorial. 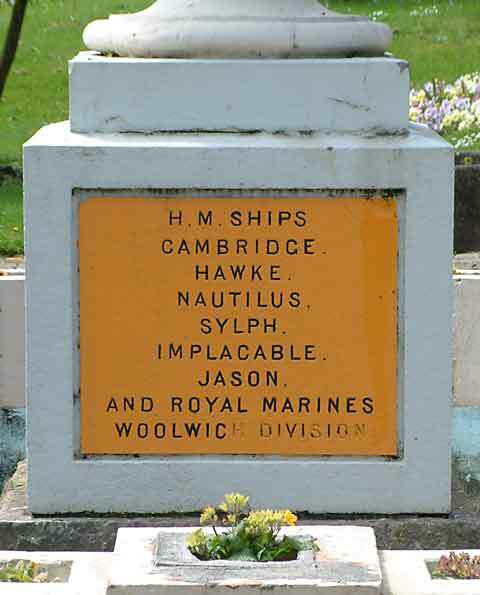 It was erected in honour of Admiral Sir Charles Napier (1786-1860) and paid for by royal marines and sailors who respected the work he carried out on their behalf; they each gave up one day's pay. Early 20th century postcard showing the fountain and pretty memorial gardens, looking west. Admiral Napier believed in looking after his men and campaigned consistently for naval reform, to improve their working conditions and to end the floggings and press-gangs - so much so that he earned the nickname 'The Sailors Champion'. When he became Member of Parliament for Southwark, in 1855, he was known to have fearlessly criticised the admiralty and naval policy. A public house in Fore Street was known to have been named after Napier in the 1850s, the Napier Inn . The Fore Street public house closed in the late 1880s and was replaced by the new Agnes Weston's Royal Sailors' Rest. 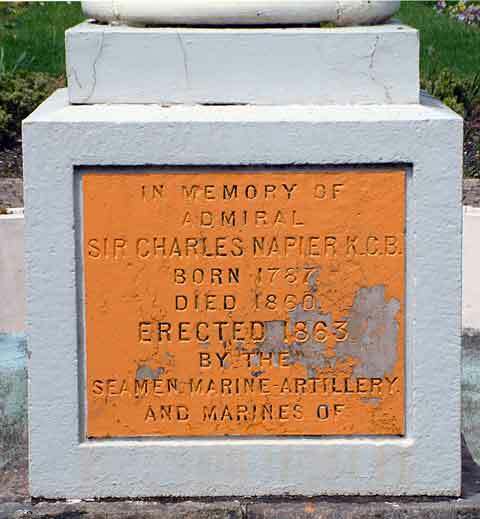 Although Devonport sailors were instrumental in obtaining recognition for Admiral Napier, and fund-raising for the memorial was initiated here, it is not specifically Devonport-related, rather, it is a national memorial, since Napier was a well-known naval officer and his achievement's were valued nation-wide, and across the entire navy. Occasionally, the pretty garden surrounding the Fountain is referred to as the Napier Memorial Garden (although, there is another memorial at the far end of this garden, the Galatea Memorial ). Until recently it was a Devonport tradition for wedding groups to have their formal photos taken in this garden, following a marriage ceremony at nearby St Aubyn church, but marriages are no longer carried out at the church, it was converted to a library in 2011. The next two images are different views of the memorial photographed in 2001, brightly painted. Above: The poor condition of the memorial by 2005, from which it was finally rescued and repaired. During the 20th century the structure fell into disrepair and several of the artifacts/statuettes disappeared. The basin was removed by museum staff around 2005/2006, for protection. The whole structure was finally restored in 2011. The fountain has a paved area surrounding it, if you'd like to visit and walk around. There is a raised circular basin from which rises a pedestal. This originally supported a tazza and a figure of a boy holding a fish, now removed and in storage, to be replaced soon. It is constructed from painted terracotta. 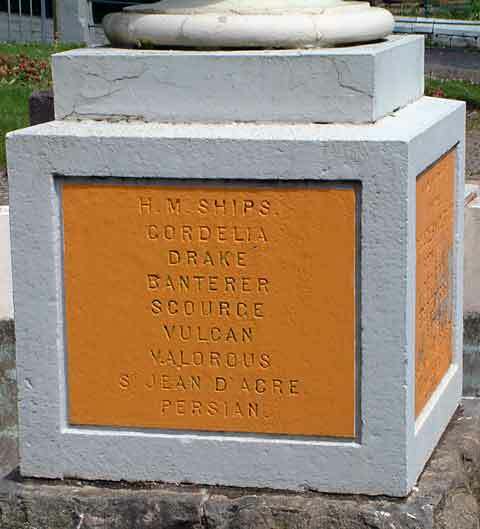 Four plaques are inserted around the base of the fountain, these list the names of the Devonport ships and Naval divisions that subscribed to the memorial. 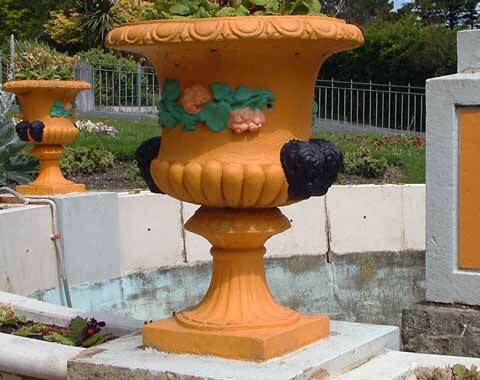 One of the remaining vases decorating the circular base of the fountain, as it looked in 2001. Four vases were seated around the fountain sometime during the 20th century (probably after WW2), taking the place of the four original mermen. 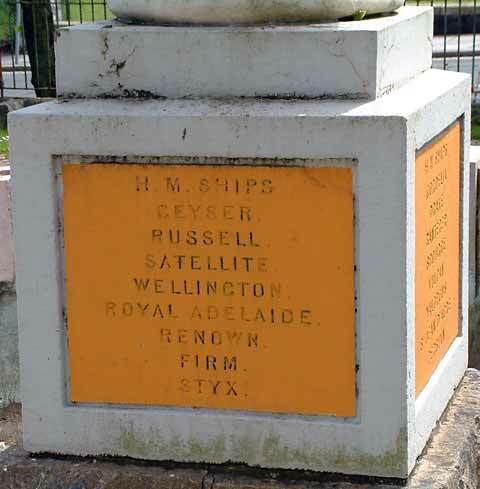 A grant of £80,000 from the Heritage Lottery Fund paid for the 2011 restoration which included reinstatement of the merman figurines, reconnection of the water and repairs to the pedestal and bowl. Missing stonework was recreated from photos, by historic monuments specialist Andy Mitchell. 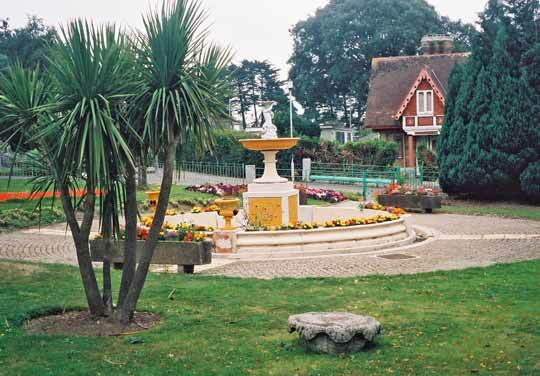 (Andy Mitchel also restored the Doris Gun in Devonport Park). 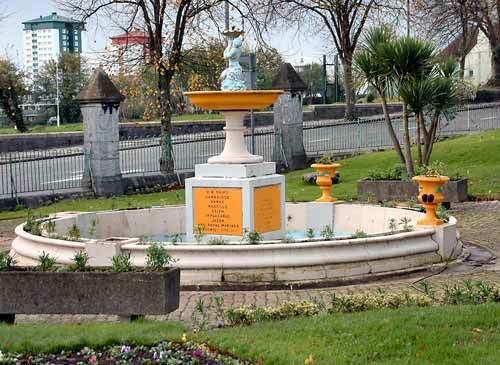 On 29 August 2011 the fountain was switched on again by Councillor Mike Leaves and Mike Gallagher, Chairman of the Friends of Devonport Park. 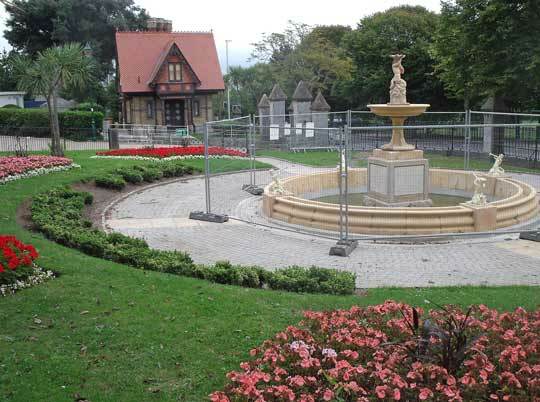 The Napier Fountain is one of two that were restored as part of the park’s £5.3 million improvement programme, funded by Plymouth City Council, New Deals for Community (NDC) Funds and receipt of the grant from the Heritage and BIG Lottery. The Napier Fountain being restored to its original condition. The above image was taken a few days before 17 August 2011, when the water was once again switched on by Mike Gallagher, chairman of the Friends of Devonport Park and Councillor Mike Leaves. Four of the little mermen are back in their places, and the garish orange paint is gone, revealing the lovely stone underneath.